How does sensitivity to current ecological and environmental issues impact on our hearing of the Gospels? About Earth’s Child listens for the ecological sounds that are present in Luke’s narrative symphony and offers a way for readers today to identify them. Michael Trainor approaches Luke’s Gospel with a fresh engagement while respecting the evangelist’s own purposes in addressing the social and cultural concerns of first-century followers of Jesus. Hearing the Gospel from an ecological perspective allows us to see how Luke presents Jesus as ‘Earth’s Child’. In the Gospel’s early chapters, Jesus is presented as born of Earth, wrapped with Earth’s cloth and laid in Earth’s manger. In the final chapters, he is affixed to Earth’s wood and laid in Earth’s receptacle from where he is resurrected and meets his disciples. Between these opening and closing chapters a remarkable story of Earth unfolds. This concerns all Earth’s members, human and non-human, organic and inanimate. It is about God, angels, demons, human beings, soil, seeds, mountains, waters, animals (even ravens, pigs and a couple of asses). Luke presents a fundamental truth about following Jesus: how one treats Earth and freely shares its fruits are central. An authentic disciple of Jesus is ecologically contemplative and environmentally respectful. About Earth’s Child sparkles with surprising insights as Jesus’ teaching and his meal and healing ministries take on new meaning for today’s world faced with growing environmental challenges. Michael Trainor is Senior Lecturer at the Catholic Theological College, Adelaide, and in the Department of Theology at Flinders University, South Australia. This is a fine, creative exposition of Luke’s gospel. 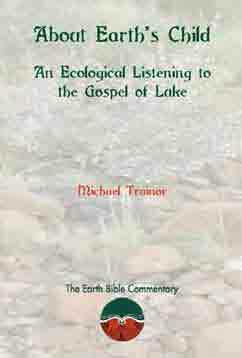 Trainor … does not attempt to impose twenty-first-century ecological perspectives on a first-century author such as Luke but, rather, studies Luke’s gospel with an alertness to ecological resonances in the text in order to fashion a credible means of dialogue with the gospel. He detects in Luke’s account of the life and teaching of Jesus a respect for the earth a God’s creation and gift. The Jesus of Luke’s “narrative symphony” (as Trainor calls it) is thoroughly grounded in the earth and its beauty from birth to crucifixion and resurrection. The Bible Today. Trainor’s work is to be commended for, among others, its sheer scope. Trainor journeys through pericope after pericope detailing the many facets of the Gospel that can be heard ecologically. For the Christian interested in finding new ways to explore the life of faith and engage one’s care for the environment, About Earth’s Child is to be recommended … [It] makes an important contribution to the larger conversation intersecting theological and ecological responsibility. C. Jason Borders, Review of Biblical Literature.